The California Current Ecosystem (CCE) Long Term Ecological Research (LTER) site is an interdisciplinary group of scientists, students, and educators that is working to understand and communicate the effects of long term climate variability on the California Current pelagic ecosystem. The CCE site became part of the U.S. National Science Foundation-supported Long- Term Ecological Research network in 2004. 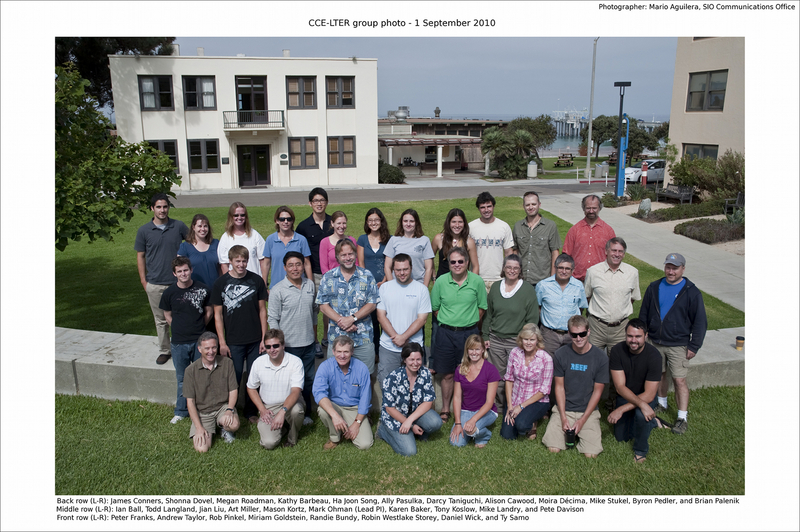 CCE is based at the Scripps Institution of Oceanography/University of California, San Diego, but currently includes partners at four other institutions (Duke University, Georgia Institute of Technology, Point Reyes Bird Observatory Conservation Science, and the Southwest Fisheries Science Center/National Marine Fisheries Service). The CCE site welcomes scientific collaborations with visitors and researchers located elsewhere. The California Current Ecosystem (CCE) LTER site is located off the southern coast of California, extending from San Diego north to San Luis Obispo and westward over 500 km. This area comprises an ecosystem that includes the California Current, which is the eastern current of the North Pacific Gyre. This gyre is a system of currents that circulate water around the north Pacific Ocean. In much of the California Current, winds acting on the sea surface transport nutrient-rich, deep water upward, where it becomes available to organisms that live near the ocean's surface. This process is called coastal upwelling. Upwelling ecosystems are among the most productive ocean ecosystems in the world. The CCE region has been studied intensively for over 60 years by a group called the California Cooperative Oceanic Fisheries Investigations (CalCOFI). Because there is a long record of observations and a rich data set from this region, scientists have noted changes in the CCE that happen over a variety of time scales. These changes include a long term ocean warming trend that has been documented over the past 6 decades, the Pacific Decadal Oscillation, and El Niños. The Pacific Decadal Oscillation is a series of warming and cooling periods that occur in 20-30-year cycles. El Niño is an episodic change in the ocean-atmosphere system of the equatorial Pacific that occurs approximately every two to seven years. El Niño is characterized by increased ocean temperatures and decreased upwelling in the equatorial Pacific Ocean, yet has influences that extend to the California Current system and elsewhere around the world. Many of the studies conducted as part of the CCE-LTER focus on changes in the ocean ecosystem that occur over these different time scales. Our Education, Outreach, and Capacity Building program teams scientists with local scientific and educational facilities engaging the "K through grey" community in both the process and the understanding gained from this research. We train undergraduates, graduate students, and postdoctoral scholars across disciplinary boundaries. Through collaborations with formal and informal science education organizations, we reach many schoolchildren each year, including local low-income and minority students. Birch Aquarium at Scripps serves as the outreach hub for the CCE LTER program, connecting public and education communities with California Current Ecosystem research and discoveries. The Information and Data Management portion of the CCE-LTER helps researchers to organize their data, and facilitates the exchange of research findings with other LTER partners, educators, policy makers, and the general public. Our information system contains the data from the various components of the CCE-LTER and allows researchers to access and combine all of those data. All of the documentation and data associated with the CCE-LTER projects is controlled by an Ocean Informatics electronic hub at the Integrative Oceanography Division (IOD) at the Scripps Institution of Oceanography.